This post was supposed to be 'Crafting with Sister #3' but my husband came up with the better offer of kayaking on the lake - so I was left to play with potatoes by myself! I can't remember how or when I learnt to print with potatoes ... but it is something I have loved doing since I was tiny - I've made pictures, wrapping paper, cards ... and now I am going to attempt to make bunny themed goodies with some items I have ordered from Dharma Trading (discovered via Angry Chicken). 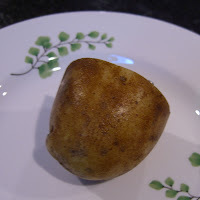 1) Find a large potato and cut it into large chunks. 2) Sort through your cookie cutters and find a small one that will fit on your potato. Push the cookie cutter well into the potato. 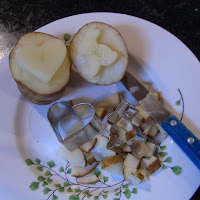 3) Pull the cookie cutter out and carefully cut away the potato around the shape - the cookie cutter will have made a very clean cut which will make it easier. 4) Practice your printing .... get a scrap piece of cloth, fabric paints and a flat plate (or a flat surface you can put paint on.) 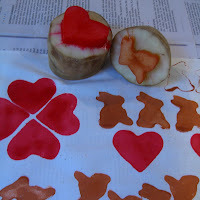 Experiment with different amounts of paint, colors, shapes and patterns until you perfect your potato stamping technique! 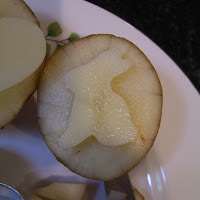 Your potatoes might dry out overnight - but the wonderful thing about using the cookie cutter for the shape is that you can remake the potato stamp to the exact size - the potatoes are also great for your compost heap! Now I'm just waiting for my package from Dharma Trading so I can get going and create something wonderful (or awful) ... I'm still battling with my frustrating fluffy lump to make that 'wonderful' too! The bunny you made is so sweet! I should really do this with my kids. thanks for the reminder of a great project!!! That's so cool - thanks for sharing!! what a fabulous idea! the cookie cutter works awesomely well - definitely on my to do list - especially for christmas wrapping paper - I must confess to an extremely large cookie cutter collection after reading that Nigella brought hers out to show guests when tipsy - it just opened the cookie cutter floodgates for me! I also love how you've arranged your hearts - I rarely think of anything that creative - usually just put things in rows! Such a good idea. I've been playing around with lino cutting and making rubber stamps recently. 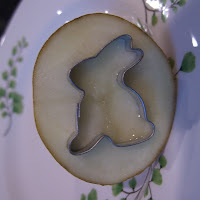 I love the idea of using a cookie cutter to get the shape. Great idea to use cookie cutters to get a more exact shape! I haven't done this since the kids were little willhave to play with potatoes again soon. Your bunny cutter worked a treat. I used to love doing these with the kids but our shapes were irregular to say the least. OHHhh, this tutorial is great! thank you for sharing! You have a lovely blog with beautiful works. What a cool idea and fun craft project! Especially for kids.